The Phillies Nation Top 100 continues today with #39. Our mission is to assess the Top 100 Phillies players of all time using impact to the Phillies, individual achievement, team achievement, traditional stats, and analytics as our criteria. The list was compiled by Ian Riccaboni and Pat Gallen with input from the rest of the Phillies Nation staff. Please check back tomorrow morning for #38. From the mid-1970’s through the early 80’s, the Phillies could count on a few things: Mike Schmidt was going to hit between 35 and 40 homers, play great defense, and be in the MVP race, Steve Carlton was going to strikeout between 200 and 250 batters and be in the Cy Young race, Larry Bowa and Garry Maddox were going to be play Gold Glove defense, and Larry Christenson was going average 25 starts a year with a mid 3’s ERA and a low 1.2s WHIP. While his contemporary teammates may have brought home individual hardware, Christenson was quietly a workhorse. 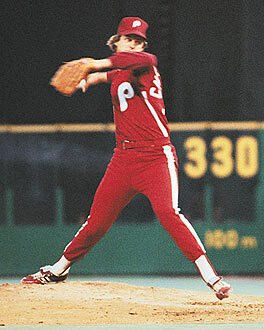 Despite injuries shortening his 1979 and 1980, Christenson pitched the 17th most innings in Phillies history with the eleventh most strikeouts. While he ranks just 85th in team history in ERA among qualified pitchers, he ranks 43rd in WHIP, and 16th in wins. Among his contemporaries, Christenson ranked 17th in the NL in wins from 1973 through 1983, and 46th out of 193 in FIP. Christenson came to the Phillies as the number 3 overall pick in the 1972 draft and made his debut with the big club at just age 19 less than one year later. At the time of his debut, he was the youngest player in baseball, and rewarded the Phillies for an early call-up by beating the Mets 7-1 in a complete game shutout. Christenson would be a Phillie through some of their brightest moments, although he struggled to stay on the field later in his career. In 1979, he suffered elbow problems and dislocated his collarbone in a charity bicycle race. In 1980, he had elbow surgery but returned in time for the World Series. Christenson would get chased in the first inning of Game 4 of the 1980 World Series. After a 2-4 start to the 1983 campaign, Christenson had more surgery on his elbow. He did not make the 1983 playoff roster. Despite his unfortunate accident during a charity event, Christenson is among the most charitable former Major Leaguers, supporting the following charities according to an interview: ALS Foundation, Phillies Charities, American Heart Association, Tug McGraw Foundation for brain cancer research, Leukemia & Lymphoma Society and Fighting Blindness with Wayne Gretzky.